Are the four words that best describe airplane travel. While some people like to hurry up and get to the airport early, there are others who like to get there right on time. I like to be an early bird, and I don’t mind waiting once I am all checked it. I bring reading and writing activities to help me pass the time. My business trip last week was unusual because it was back to back. I drove home for two hours, from one trip, and got home with just enough time to restock my carry-on luggage with fresh clothes before my flight. I was speaking at the Trauma Conference in Lexington, Kentucky the following day and my plan was to get to my hotel by dinner. My check in at the airport was uneventful and I found a nice seat to plant myself before I boarded. At the boarding area, I amused myself by watching a movie on Amazon Prime. Everything was going great until I looked up at the departure time for the flight and noticed that my first flight was going to be 10 minutes late. I didn’t think much of it until I noticed a group of people started to congregate in front of the flight screen as if watching a suspense movie. I got curious and looked at the screen and immediately knew why they were glued to it. The 10-minute delay had changed to 40 minutes. YIKES! Normally, this kind of waiting did not bother me, but in this instance, it did because this delay could mean that I would miss my connecting flight to Kentucky. I didn’t give up. I was still going to make a run for it when the plane landed, just in case my connecting flight was delayed, as well. As soon as my plane landed, I grabbed my carry on and ran and ran and ran. I didn’t stop even though there were signs along the airport that notified the passengers how long the walk was from one gate to the other. My walk was 15 minutes long because my plane was at the other side of the airport. As you can imagine, I did not make it. I had a three hour wait for the next connecting flight, and I decided to give myself some much-needed time for self-care. I filled up my empty water bottle and drank my water as I walked around the airport. I made the most of it. Since I woke up at 4:00am that morning, all I was focused on was getting to my destination. I had forgotten to take care of myself by drinking my usual amount of water and getting in my 10,000 steps. In hindsight, using my three hour wait to hydrate and walk made a big difference. Even though I felt tired, I was happy that I was able to get in my typical amount of fluids and steps. What an adventure! Needless to say, I slept well that night. When I woke up the following day, I felt ready to speak at the conference. 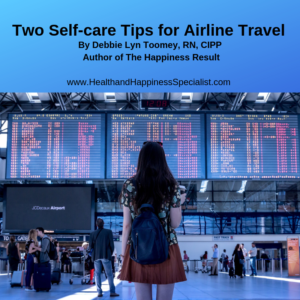 Self-care is important especially when you are travelling. As we all know, while the thought of travelling can be fun and exciting, it can also be very tiring and stressful. Be sure to take good care of yourself during this time. My suggestion is to keep hydrated with water and walk around to circulate the blood in your system. These two self-care tips can help you stay healthy and happy during your trip. Take care and safe travels to you and yours. To learn more ways to add happiness and self-care techniques into your busy life, visit my website www.healthandhappinessspecialist.com. If you need a speaker for your next event, contact me at debbielyn@healthandhappinessspecialist.com. I speak on topics of happiness, mindfulness, and gratitude for positivity, peak performance, and inner peace. This entry was posted in balance, Health, Positivity, self-care and tagged balance, happiness, health, stress relief, success. Bookmark the permalink.